A great deal of new Standard decks will be available once Born of the Gods is released. Why is is this? Because another chunk of mana fixing will have become available. Once the rest of the the Theros block Scrylands are printed, those color pairs that were lacking critical mana fixing will see help. As soon as these pairs have better mana, new strategies will open up for deck builders to take advantage of less used color combinations. Which Scrylands have we yet to see? We aren’t exactly sure which lands we’ll be getting in Born of Gods and which will be in Journey into Nyx. That doesn’t stop us from planning ahead, though. Based on these missing Scrylands, I am going to offer my insight into what cards could benefit the most once once their respective fixing is available. Gaze of Granite is a powerful removal spell that could see play in B/G control shells that might start popping up once the mana is available to support it. I like this card as a target because it is from Dragon’s Maze, a set that wasn’t opened a ton. I’ll be keeping my eye on this card once the spoiler season for Born of the Gods comes along. My colleagues and I at this website have discussed Lotleth Troll from time to time and I still think that he has a bit of room to grow. Especially since Kibler has this zombie on his radar, I think it is safe to say that it can be a powerful card in Standard. $1-$2 is still a cheap price for him. I’ve mentioned Reaper of the Wilds in my set review for Theros and it looks like Kibler and a few others have played with this card since then. I’ve seen some other builds online that put this card into both a control and aggro shell. I’m not sure if the fit for Reaper is an aggro or control yet. Depending on the match-up the card can be good in the mid-game as a blocker against an aggro deck, and can also be useful if played on turn six with two mana up to activate hexproof against removal-heavy opponents. I really wanted Varolz to take off in price, but he never did. I feel like as more cards enter Standard the potential synergies for Varolz will only increase. Exava is being played alongside of Xathrid Necromancer, so I don’t think it is too far of stretch to see Varolz in these builds once better mana fixing is available. I really like Advent of the Wurm and will be watching the card moving forward. This is another card that I’ve been watching for a while because I feel that Selesnya decks have a lot of synergy and power in Standard. What they are currently lacking is mana fixing, and once the G/W Scryland comes out, a lot more players will be comfortable slinging the more powerful Selesnya spells. Armada Wurm packs a lot of raw power. Unfortunately this just isn’t enough to make it good in Standard. The synergy with other similar effects, like Populate and mana fixing, must exist to complement the power. In addition to being a possible tournament staple, Armada Wurm will be a popular casual card in the future which is another reason I like picking them up. 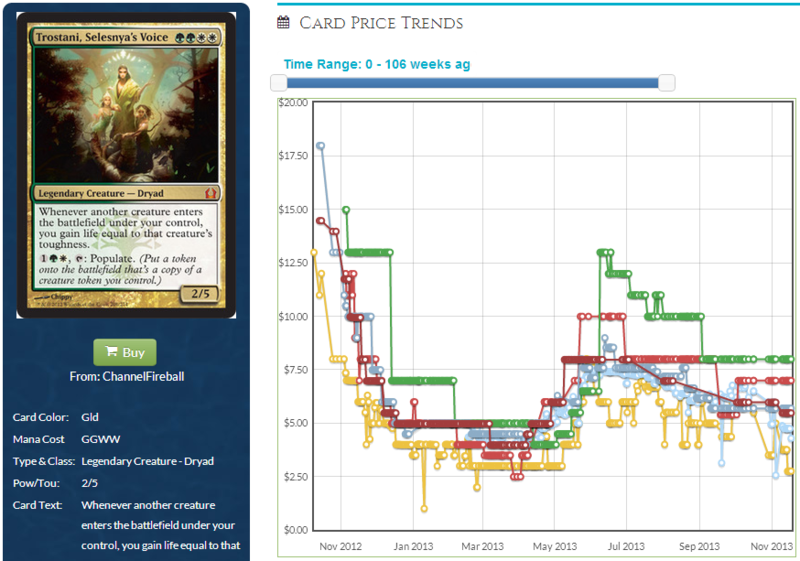 I predicted that the Lion would dip heavily once more Theros was opened and it looks like that is the case. There hasn’t been much financial chatter about Fleecemane since his debut except the advice of stay far away. However, I feel like now that the Lion has dipped down into the $3 range that he could be a good pickup. Will the G/W Scryland make this card better? Will it only be a casual hit? Either way, $3 is pretty low for a strictly better Watchwolf. I feel like at this point Loxodon Smiter should have taken off if it was supposed to. When he is played, either in control or aggro, there are always three or four copies. There have been plenty of decks that have top-eighted or won that featured three or four copies of the Elephant. At $2 this still feels undervalued to me. Trostani has had an interesting financial life. Having started out near $20 in October 2012 and then falling to $4 in the spring of 2013, this mythic rare took quite a tumble. She went up to $8 this summer, and now Trostani is back to the $4 range. A card that fluctuates this much in price is definitely one to keep an eye out for. Clearly, there is potential here for her to be a tournament staple and also to be a casual all-star hit. Once the G/W Scryland is printed it could be enough to really push Trostani’s price up until the end of her standard life. 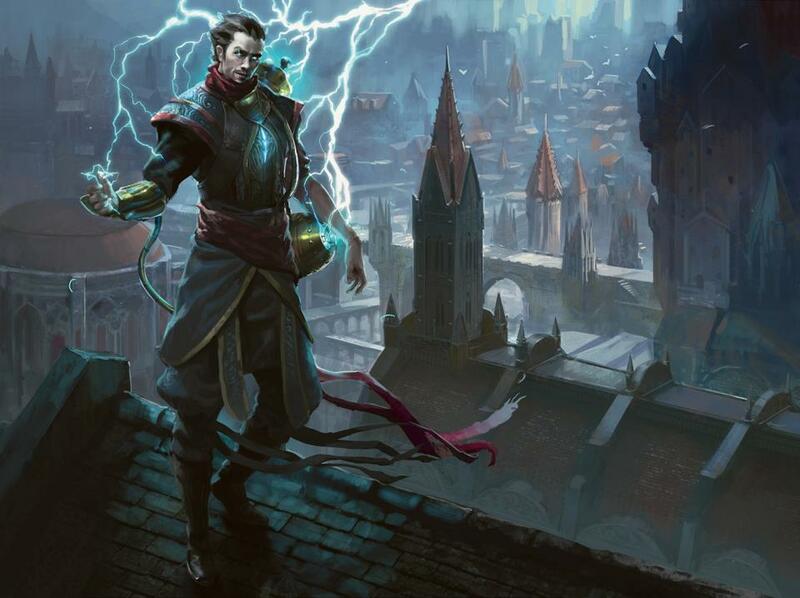 Ral Zarek is my only pick for U/R that could see a big price increase once the new Scrylands are available. Ral Zarek is kind of insane with Nykthos, Shrine to Nyx – tapping down an opposing blocker whilst untapping my Nykthos? He might find a home in some sort of U/R devotion. Unfortunately, Ral Zarek is currently my only pick for U/R because there aren’t a lot of powerful spells at rare and mythic rare in Standard for Izzet. U/R seems to have fallen out of a favor as a color combination utilized – Born of the Gods could change that. The Azorious Scryland will only add to the power of the existing W/U Control deck that exists in Standard. All of the staples of that deck from a financial perspective have already reached their peak values. I do not believe that the Azorious Scryland when printed will affect the price of any particular W/U rare or mythic in a significant way. The only change I could see it making is increasing cards that mesh well with Esper control lists, such as Obzedat, Ghost Council. Exava was able to take down a GP, so there is clearly a lot of power in her ability to strike fast and hard. Since she was printed in a preconstructed deck there is a cap on the price she will be able to command. Despite this, I could easily see Exava creeping up to $5 or $6 once more Rakdos builds are available when the new Scrylands are released. Rakdos’s Return is a powerful spell that hasn’t been given a lot of love lately. It appears from time to time in Standard decks but that hasn’t been able to earn it more than a $6 price tag. Rakdos’s Return could be a good pick for the future because once more B/R is played. Tymaret represents a lot of what “could be” in Standard. It only needs a few more pieces (and better mana fixing) to really make him take off and become the centerpiece of a Standard deck. Since he can only hit players, the deck would need to be focused around a lot of graveyard recursion or token generation in order to really maximize the effect of sacrificing creatures. From a financial standpoint, Tymaret is currently bulk and can be had as a trade throw in. Not a lot of downside and a lot of potential upside if more support is added. Could my speculation on Underworld Cerberus actually pan out after all? I have been seeing a lot of buzz online for the power of Cerberus, and it will only get better once more optimal mana fixing is printed for the Rakdos. It has gotten super cheap to pick this card up, so it could very well be a huge winner when the new Scrylands are revealed. There is a lot of unused potential in Standard because of the missing Scrylands. There is still plenty of opportunity abound for the savvy trader or player to pick up cheap copies of spells before they potentially spike. Once the new Scrylands are printed the landscape of Standard will change, and currently underutilized cards may see a huge surge in play.